Super Mario 64 is the best 3D plumbing simulator available on your system. 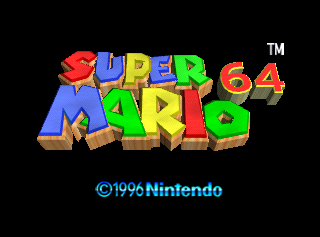 One of three launch titles for the Nintendo 64, it introduced the third dimension to the Mario universe and revolutionized the Mushroom Kingdom. A number of fun debug functions remain in the game. What's interesting is the fact that there appears to be no way to spawn these into the game itself. These are most likely hard coded to not appear. 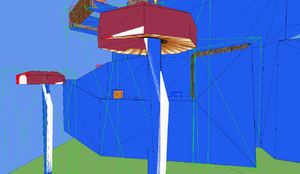 The models shown in Toad's Tool 64 also appear to be mostly the Snowman's Head which includes the cannon that is usually loaded in most of the game's model banks. 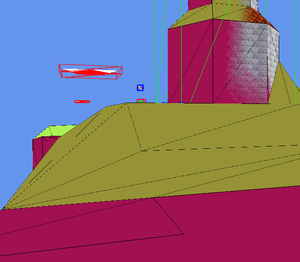 There is a third copy of the ship placed above the other two, which is only around during the Plunder in the Sunken Ship mission, and cannot normally be seen without viewing the stage in an editor. 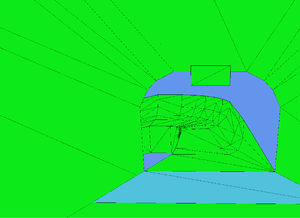 It resembles the other two, but has no collision data. Left: Animation #114. This is the normal running animation. 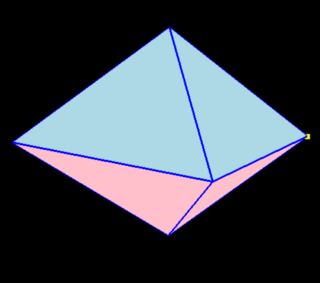 Right: Animation #115. A duplicate running animation that appears to be identical to the normal running animation. Left: Animation #145. This is the regular sitting animation. Right: Animation #142. This unused animation appears to be Mario sitting motionless. Perhaps this was the original sitting animation, before they decided to have Mario move his arms to make the animation more visually interesting. Left: Animation #191. This is the sideflip animation. Right: Animation #73. This unused animation appears to be a sideflip variation where Mario flips forward instead of sideways. Find offset for how to load in the regular non-extended US-version. The bullies have an unused animation for kicking. A video showing this animation can be seen here. To view this in-game, replace the value in the extended US-version offset 0x882956 with 42A4. In an official strategy guide interview, Producer/Director Shigeru Miyamoto revealed that "Mario was able to throw the rabbit" at one point during development. There is an unused animation that appears to have MIPS bounce on the ground while recovering from a fall, likely a result from being thrown. A video showing this animation can be seen here. 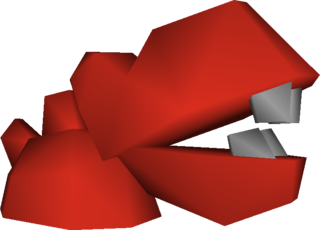 To view this in-game, replace the value in the extended US-version offset 0xA4C1E1 with 013338. This plant has an unused animation that is similar to the sleeping animation seen in footage from Nintendo Shoshinkai 1995. 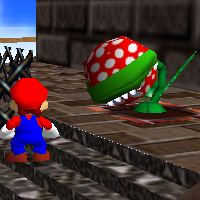 It features the plant showing its teeth as it sleeps, although differs from the Shoshinkai demo since Piranha Plant occasionally bobs its head like it is having a sleep reflex. A video showing this animation can be seen here. To view this in-game, replace the value at US-version offset 0x1D5DF9 with 01AAE4. 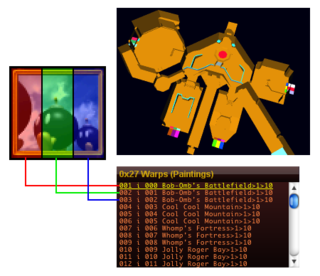 In Whomp's Fortress, a level editor shows that an unused object can be seen next to the cannon that appears to do nothing. Looking at the script associated with the object reveals a clearly stubbed out function that only checks the water level associated with the object. // ...the function returns without doing anything. likely commented out code here. 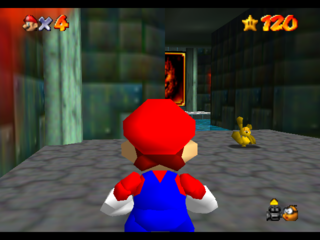 This object is actually a relic of how the Fish Easter Egg in Super Mario 64 worked in the prototype build. 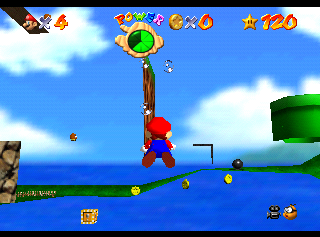 In the final game, the game does a 1/256 roll every time Mario makes a splash to see if a fish splashes along with the puddle. 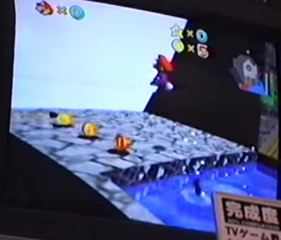 In the Shoshinkai 1995 Mario 64 footage, the same can be seen at the exact spot of the unused object. The exact reason for the change is unknown, but it is likely that the change was made because having an easter egg associated with an object meant an object slot was taken up, where as a simple 1/256 roll removed the need for these objects. The object highlighted in yellow is a stubbed out useless object. 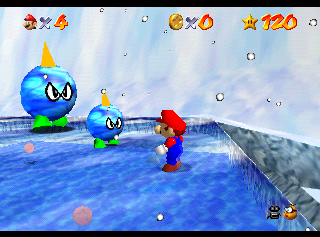 The jumping blue fish can be seen in the unused object's location in the prototype build. Replace the 2D body with the 3D body. 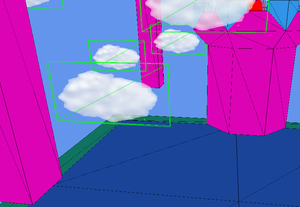 The 3D body can overwrite the 2D body by inserting at 01D360 at 0x200FFD, but it doesn't scale properly. 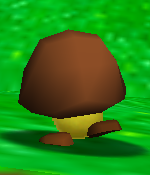 Goomba has a darker variant of its head. Although it lacks textures, the color matches that of Goomba's feet. 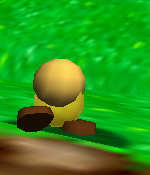 There is also unused round 3D geometry for Goomba's body, which was possibly replaced with the 2D body to increase the game's performance. 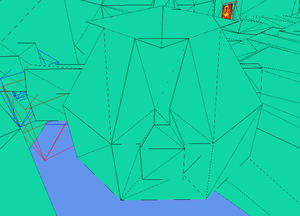 The unused head can be loaded in-game by replacing the value at US-version offset 0x201021 with 01D0D0. Located with the geometry for the Bullies is a large round 3D object, possibly once intended to have been the body for Big Bully. It is slightly larger than the round 2D body used by Big Bully in the game, and can be loaded by replacing the value at US-version offset 0x134C7A with 3878. This message comes after the greeting that appears when Mario enters Big Boo's Haunt for the first time. When the unused message is activated, a short Boo laugh plays as the text box appears. While it was translated in the English and French versions of the game, it was, strangely, never translated for the German release but was actually translated into Chinese for the IQue Player release. Bye bye my dear Mario! I can go through walls! 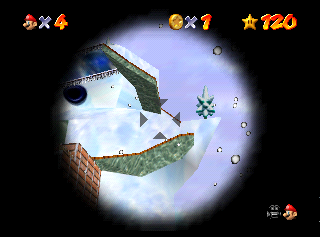 One example of an unreachable coin is located in Snowman's Land. 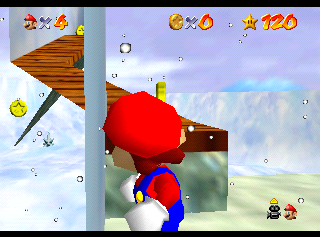 There's a single coin stuck inside the snowman at the wooden path, at the side where you'd climb it. There's also another line of coins on Tiny-Huge Island that has an unobtainable coin in it. This one is actually impossible to collect, because, due to a failsafe mechanic, the coin unloads on the same frame that it's loaded. This is due to the properties of its spawner object. When a five-coin object spawner is loaded, it spawns five coins 300 units above it. 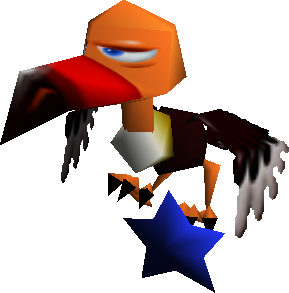 It checks for ground starting from 78 units above the coins, then moves the coins to the nearest floor triangle below them. However, if the nearest ground within this range is above the coin's hitbox, the coin will immediately unload. Because this spawner in Tiny-Huge Island is loaded underground, the coins spawn in such a way that the fifth one (on the far left) triggers the failsafe. Some of the collision oddities mentioned here are worth noting. 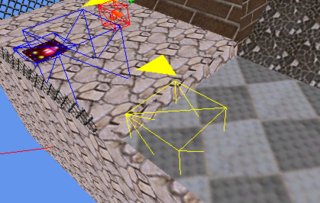 The game uses separate polygon meshes for visual (intangible) geometry and for collision geometry in each course. They were apparently not always kept in synch during development, and so one sometimes hints at geometric features that were later changed or removed from the course altogether. 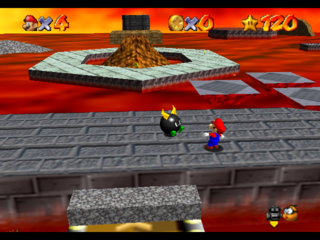 Although never possible by the normal game's standards, Mario can hang on the starting cloud of Wing Mario Over The Rainbow. This can only be hanged on if solid ground of any kind is present under this cloud, as shown at 1:06 in the video. This oddity still exists in Super Mario 64 DS. 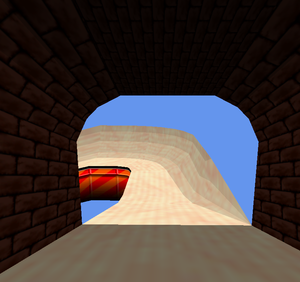 In Tall Tall Mountain's slide area there is a single rectangular polygon above the exit of the tunnel, which has collision but is invisible. This is a leftover from a sign with an arrow pointing to the left that can be seen in prerelease materials. The large mushrooms around the outer area of the course have a straight stem mesh for their collision, but visually their stems are bent. This possibly suggests that the stems were originally straight and then edited later to make them bent. 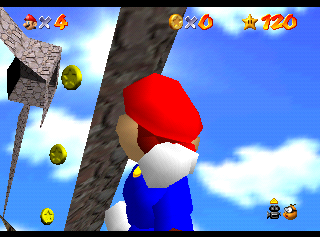 This oddity still exists in Super Mario 64 DS. 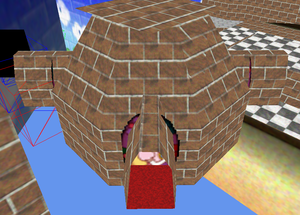 In the room of the castle where The Princess's Secret Slide is accessed, the 3 windows showing Peach extend by the same distance. Their collision geometry is cut off however, so only one of them can have their windowsill walked on by Mario. The towers extend much further downward visually than their collision geometry. 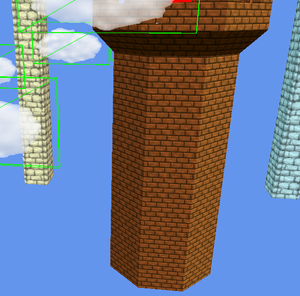 This theoretically means Mario can fly right through the towers at their bases. The two spires at the back of the castle have no collision at all. 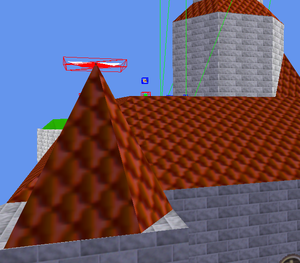 This is easily noticeable in-game as the top of the tower (where Yoshi is) can be reached and walked around. At 0x070184C8 in the Wet Dry World level data, an unused collision list for the Water Level Diamond object can be seen. However, the code for the object handles the hit detection in-code, so this list is not used. This page was last modified on 18 April 2019, at 00:42.